The recipient of the second annual NIGHTSEA/EMS KEY Award for New Faculty is Dr. Sarah Petersen, the new Ashby Denoon Assistant Professor of Neuroscience at Kenyon College. 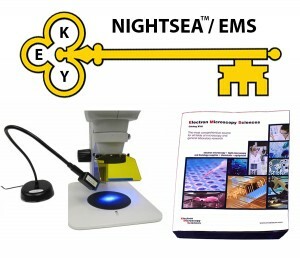 The award, sponsored jointly by NIGHTSEA and Electron Microscopy Sciences, includes a NIGHTSEA Stereo Microscope Fluorescence Adapter system outfitted with two excitation/emission combinations plus $750 in supplies from the EMS catalog. The KEY Award was created by NIGHTSEA founder Dr. Charles Mazel to acknowledge his own mentors and to give back to Science. Dr. Petersen continues that tradition. As she explains, “Kenyon College is a small liberal arts, undergraduate college, with limited research resources relative to larger research institutions. Nonetheless, I am confident that my undergraduates are capable of top-tier quality work with the right resources.” She plans to make the SFA one of those resources, using it both in her undergraduate classroom and in her research with the zebrafish model to understand the relationships between neurons and glia and their environments during neurodevelopment. Her curriculum and research projects are designed to provide students with a background in genetics, developmental and molecular biology, pharmacology and neuroscience that will prepare them for careers in science, medicine, Pharma, and health policy. A key goal: to help students frame better questions with which to investigate the world. The 2017 edition of the KEY Award will be announced in January. Researchers entering a new faculty position at a US institution any time in calendar year 2017 will be eligible. Dr. Robert Mitchell (University of Wisconsin Oshkosh) was the recipient of the inaugural KEY Award in 2015.